We want you to feel happy, safe and secure in your new home so we will provide you with a quality, affordable place to live and great customer service from all our staff and contractors. Most Two Rivers’ homes for rent are in the Forest of Dean, although we also have a number of properties in other areas of Gloucestershire and in Herefordshire, too. We also have some garages and parking spaces available to rent to tenants and non-tenants alike. 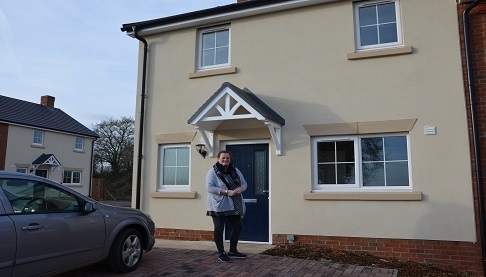 If you are interested in renting a home from us, you need to apply through either Homeseeker Plus, or Home Point for properties in Herefordshire. You will find more information in the section ‘Apply for a home’. Repairs and maintenance to your home. Dedicated staff who can give you benefit and debt advice. Dedicated staff who can support you with nuisance and anti social behaviour issues. Dedicated staff that can support you in your tenancy and the environment on the estates. Help with fitting aids and adaptations if you have a disability. You will also be able to get involved and have a say in what we do. This may be on a formal basis, as a member of one of our tenant groups or our Board, or more informally via occasional surveys or checking on estate services. The right to transfer or exchange your tenancy. A full list can be found in the ‘Tenants’ Handbook’, which is saved in the ‘Library’. Paying your rent and service charges on time. Not allowing any person who lives or visits your home to cause a nuisance or anti-social behaviour. Making sure your home and garden are maintained to a good standard. Reporting repairs to us as soon as you notice a problem. A full list of your responsibilities, and ours as a landlord, can be found in the ‘Tenants’ Handbook’, which is saved in the ‘Library’. All tenants new to Two Rivers will be given a Starter Tenancy which lasts 12 months. If there is no breach of the tenancy conditions during this time, you will move to an Assured Tenancy. If you’re interested in renting one of our homes and would like more information, please contact us and ask to speak to a member of our Neighbourhood Housing team. If you are thinking about the Shared Ownership option, please contact our Home Ownership team by email or on the same number. We are so lucky to have this house. We know that larger bungalows are in high demand and I can't say how grateful we are to have it.